What do you do when you have a multi-million dollar apartment block with a view to an unsightly concrete roof deck? What if you could design and create a roof deck that is practical, aesthetically pleasing and good for the environment? This challenge was faced and overcome by Melbourne-based Edaw Gillespies during a project for the Four Tower 'Yarra's Edge' Mirvac Development. As part of an increasingly popular trend, Edaw Gillespies designers created a green roof that transformed the crowded and dark urban structure into a green and extravagant green roof. DécoR Pebble was the main supplier of decorative pebbles and recycled glass, which made this green roof project an aesthetic and practical success. This well designed green roof is characterised by protective and sustainable attributes that allow energy to be preserved. 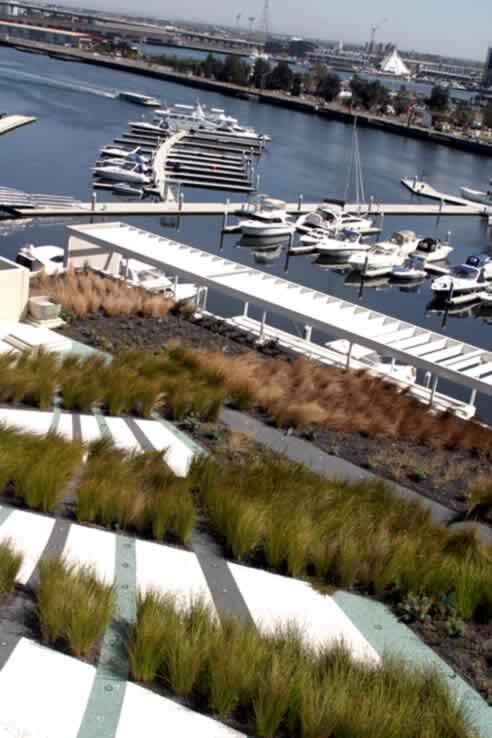 Green roofs are able to decrease the impact of Urban Heat Islands as well as control storm water run off. These attributes are increasingly becoming important ecological objective of modern and sustainable designs, which are enabled through green roof designs. The Four Tower 'Yarra's Edge' development shows that green roofs make the cityscape a remarkable and attractive structure while being environmentally beneficial. This green roof was created using a combination of native grasses, crushed recycled glass and three decorative tumbled pebbles in white, black and claret red colours. This project signifies a growing acknowledgment for the need to more with a roof deck than just apply a heat reflective unattractive waterproof membrane. 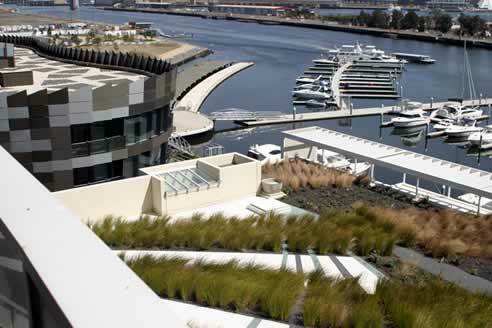 DécoR Stone Company Director, Geoff Iles, says that green roofs projects like the Four Tower 'Yarra's Edge' development are a blend of new aspirations and necessities. "This green roof epitomises the new direction that designers are adopting universally enabling contribution to a healthier environment while incorporating aestheticism." I would like to enquire about Decor Stone.